I just completed probably my best ever spinning. It started life as Fyberspates Sparkle Fibre dyed top, a luxurious blend of merino, silk and glittery stelina, in ‘grey and mauve’. It’s pretty, evenly spun, evenly plied, bouncy and soft, but… I’m not overjoyed with it. First of all, I seem incapable to skinning two skeins of the same fibre to the same weight, despite spinning them within 24 hours of each other. 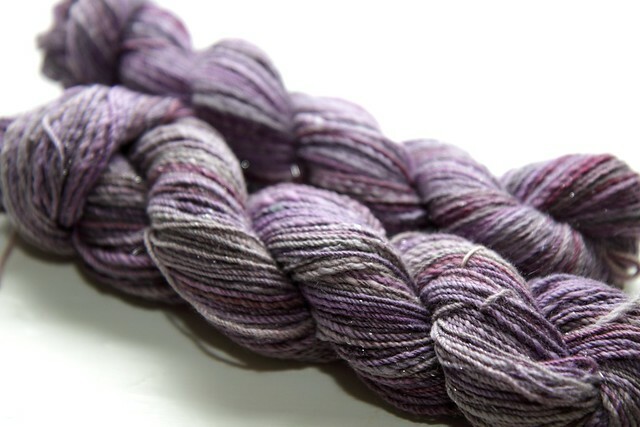 The first came out 134 m/50 g (sport-ish weight), while the second is 185 m /50 g (a standard 4ply). It’s not such a problem, they look pretty similar, and I plan to use the yarn for socks so the thicker of the two will be used for the leg. Inexplicable as it is, I accept responsibility. What I’m less happy about it the distribution of colour. I tend to buy Fyberspates fibre whenever they have some in stock; the fibre quality is second to none and the colours are subtle and unusual. When it arrives, it’s every bit as pretty, soft and squishy as I’d hoped. It’s only when I come to spin it I start to feel disappointed. In this batch there are vast lengths of dull, grey fluff and a few small, unevenly distributed, pink and purple splodges. I had similar problems with other pieces, spun last year. In the photo below, you can see a single strand of dark pink – this is going to come out as a lone, very noticeable stripe in an otherwise uniform pair of socks. I did my best to spread it out. With hindsight, I should have split the entire piece lengthways into into many narrow sections and spun them in turn. That would given me a more even, repeated effect. That’s more ‘editing’ than I’d expect to have to do with fibre that cost as much as this. 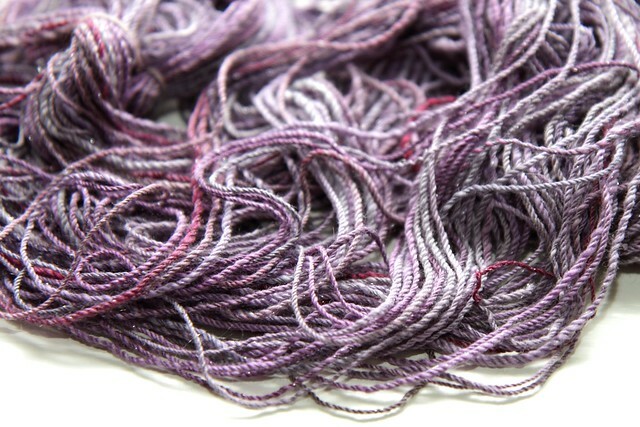 Another complaint is that on soaking, the colour bled a lot, I mean A LOT – it dyed the scrap yarn I used to tie the skeins. I suppose it’s better to find it out now, rather than when the socks get their first wash.
I’m still a big fan of Fyberspates, I have no complaints about their yarn! But I’m a little disappointed with this batch.